Racing 92 have a drop goal attempt through the boot of Rémi Tales, but he pulls it to the left. Devin Toner has made 10 good tackles so far this game. James Ryan has made 10 good tackles so far this game. 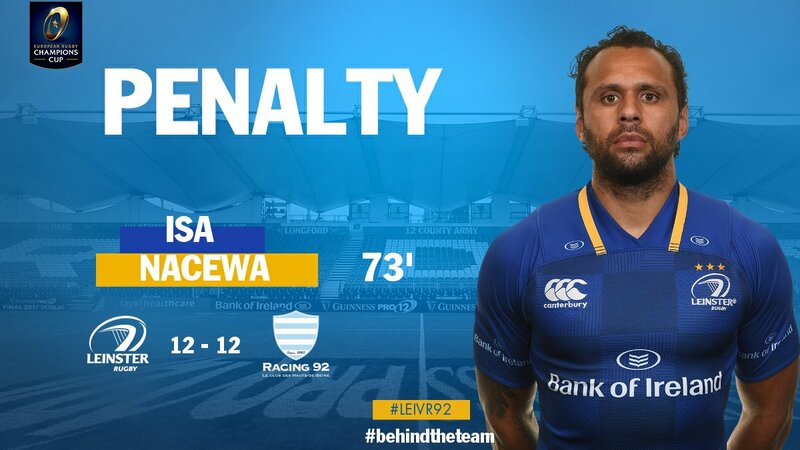 Isa Nacewa kicks the penalty. Racing 92 have won 80 rucks so far this game. 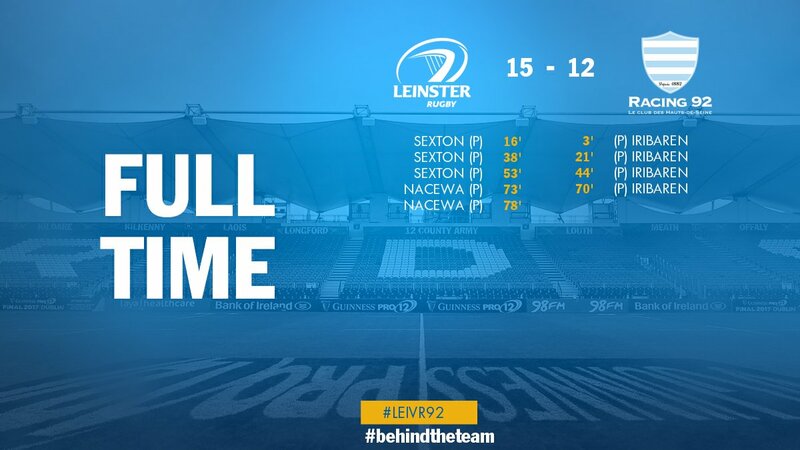 Leinster have won 100 rucks so far this game. Isa Nacewa has kicked a penalty goal. This is dangerous for the defence as Scott Fardy bursts through to advance the Leinster attack. 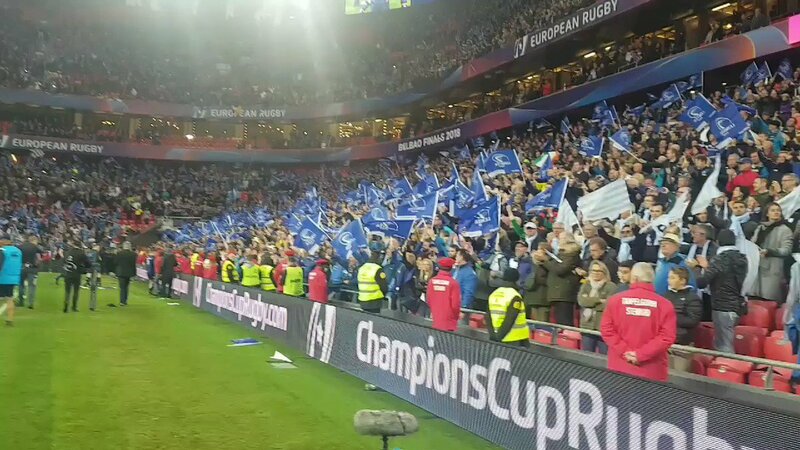 The Racing 92 supporters go wild as Teddy Iribaren successfully kicks the penalty goal. Bernard Le Roux comes off. Racing 92 have won 60 rucks so far this game. Dan Leavy has made 10 good tackles so far this game. The touch judges have waved away the attempt by Teddy Iribaren as he hooks it left. Leinster decide to make a substitution, with Jamison Gibson-Park getting some game time. Leinster decide to make a substitution, with Luke McGrath being replaced. Leinster make a substitution with Jack Conan coming on. Leinster make a substitution with Jordi Murphy coming off. Leinster sub James Tracy comes onto the field. 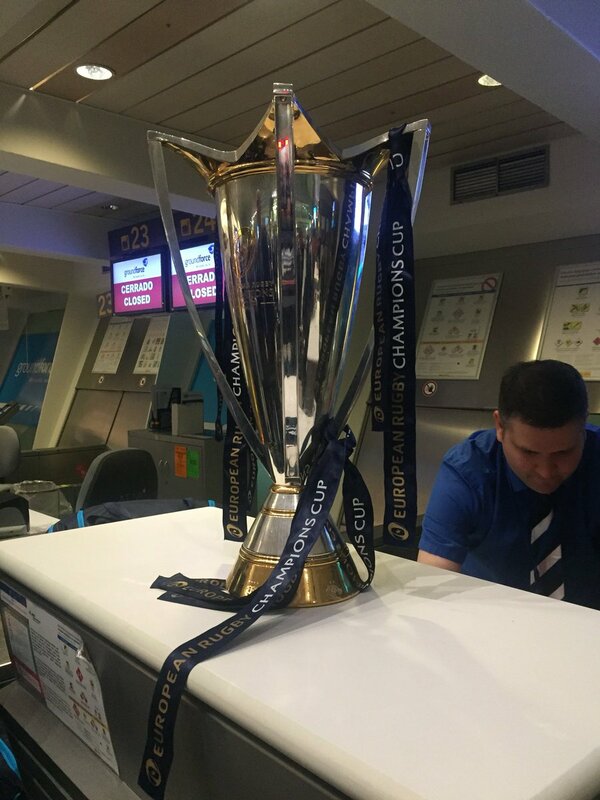 Sean Cronin departs for Leinster. Ole Avei comes on for Racing 92. Camille Chat leaves the field. Leinster have won 80 rucks so far this game. Camille Chat has made 10 good tackles so far this game. Donnacha Ryan has made 10 good tackles so far this game. Johnny Sexton steps up to take the penalty but pulls it wide and to the right. Cedate Gomes Sa comes off. Eddy Ben Arous comes off. Racing 92 decide to make a substitution, with Camille Chat getting some game time. Racing 92 decide to make a substitution, with Ole Avei being replaced. The touch judges raise their flags as Johnny Sexton kicks the penalty goal. Bernard Le Roux has made 10 good tackles so far this game. Leinster have won 60 rucks so far this game. Wenceslas Lauret has made 10 good tackles so far this game. Johnny Sexton steps up to take the penalty but pulls it wide and to the left. Racing 92 make a substitution with Ole Avei coming on. Racing 92 make a substitution with Camille Chat coming off. 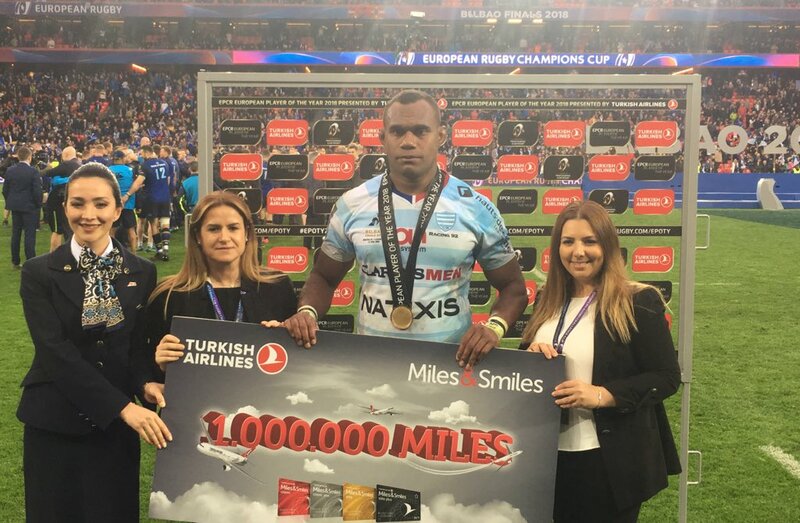 Teddy Iribaren adds the points for Racing 92. Racing 92 have won 40 rucks so far this game. Johnny Sexton does the business as his penalty goal attempt goes over. Racing 92 sub Louis Dupichot comes onto the field. Joe Rokocoko departs for Racing 92. Leinster have won 40 rucks so far this game. Joe Rokocoko comes on for Racing 92. Louis Dupichot leaves the field. Racing 92 have won 20 rucks so far this game. Leinster have won 20 rucks so far this game. Teddy Iribaren makes no mistake with that penalty goal attempt. Johnny Sexton kicks the penalty. A gap opened in the defence and Isa Nacewa took full advantage. The defensive line has been broken as Pat Lambie goes through the gap. 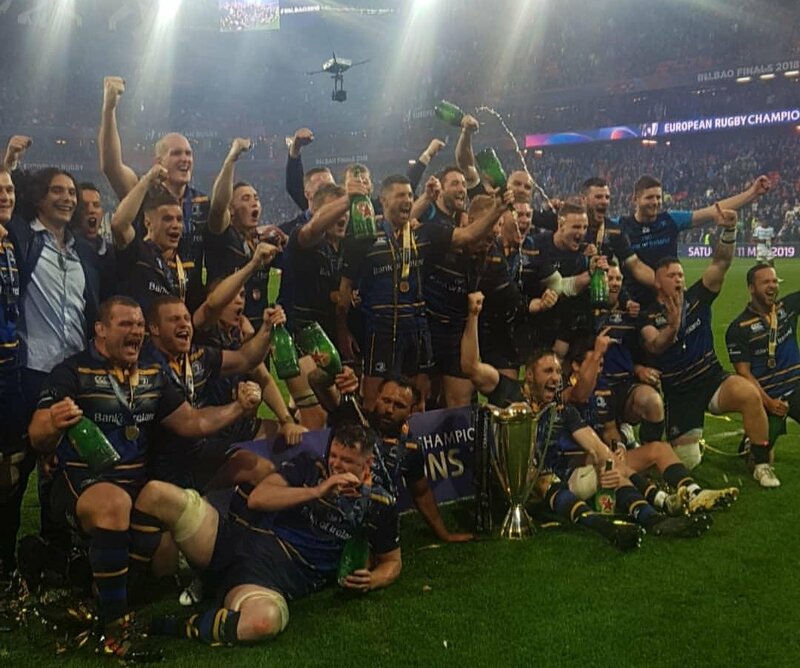 RT @bankofireland: Sometimes a team inspires a province. Sometimes a province inspires a team. 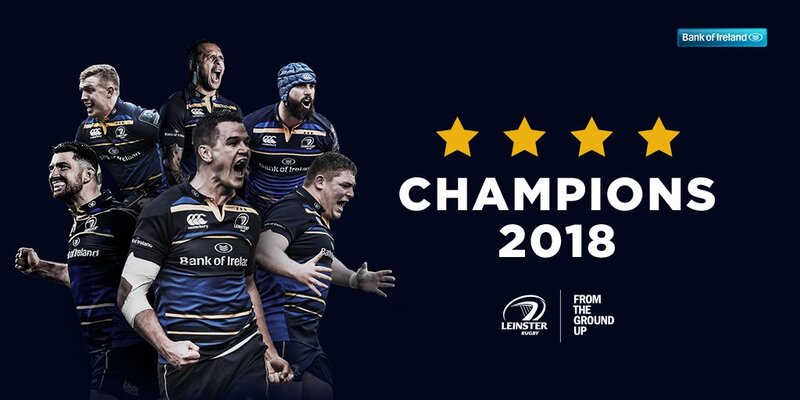 @leinsterrugby Hats off to you for your win ! 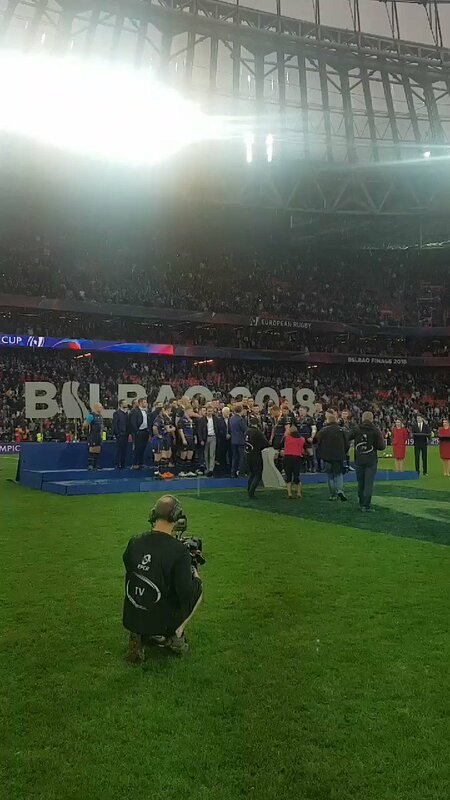 Le leinster revient au score grâce au pied de Nacewa. Pénalité en faveur des Racingmen !